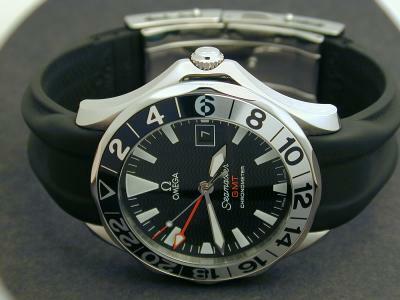 There are plenty of good reviews of the Omega Seamaster GMT out there. Of note is CPM’s review on TZ Classics #1214. 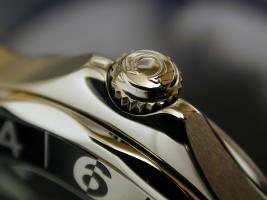 Another good reference is White Rabbit’s GMT Watch Manual on TZ Classics #1036. Therefore, instead of trying to compete with these fine offerings, I am merely going to put up a bunch of scans, and point out where I think there are some outstanding features. The packaging is well done – an orange leather covered box with a suede-finished interior makes for a very classy presentation – yet quite a bit different from the white-leather “portfolio” case that the Co-Axial DeVille came in. 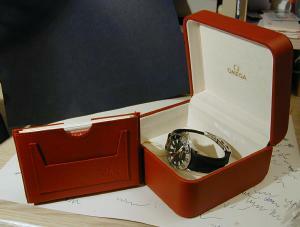 The watch came with a Worldwide Service booklet, an Operating Manual for the watch, an “Operating” Manual for adjusting the strap, and a Chronometer certificate. 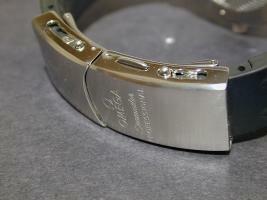 The strap is made of rubber, and must be physically cut to fit the wearer. The overall effect is somewhat more restrained than a bracelet’s flash, yet with the prominent ridges, is still agressively sporty while being functionally useful. While this clearly ensures an excellent fit, this could be a problem if you purchase this watch secondhand from someone with narrow wrists. 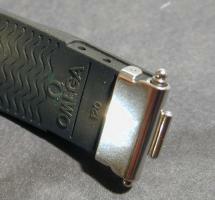 This image shows how the two strap ends are held in the clasp – using the two oversized “spring bar” ends. Note that the tracks allow for the overall strap length to be adjusted to fit over a wetsuit. Unlike a folding extension, they can also be used to expand the length by a small increment to allow for additional comfort if one’s wrist is pumped up from exercise, for instance. The transition between the brushed and polished surfaces are perfect, and the overall effect of sweeping polished part nicely offsets the brushed surface. While the overall effect is on the flashy side (it is a sports watch, after all), this is a nice level of refinement noticeable only on second glance. 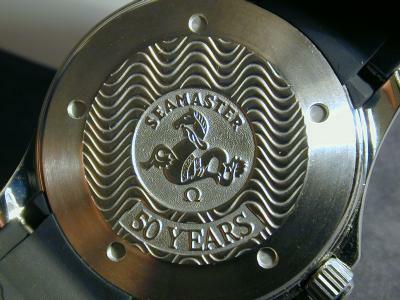 The caseback has a nice engraving of the “Seamonster”, with the added “50 Years” inscription. This inscription pays tribute to the original Seamaster, released in 1948, and is thus far restricted only to the GMT’s back. Functionally, the Seamaster GMT has implemented the GMT function following the lead of Rolex and Blancpain – by keeping the 24-hour hand constant. 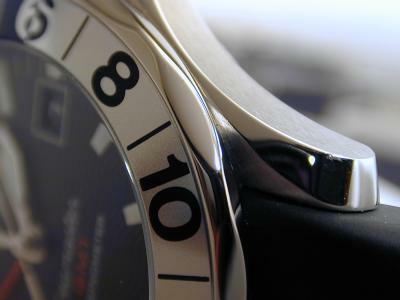 The twelve-hour hand quicksets both forward and backwards, and can be used to adjust the date in both directions as well. The tactile feel of the quickset is of a very solid mechanism, somewhat more so than the Rolex (which I cross-shopped with this watch). 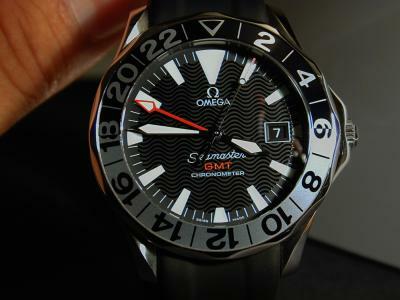 Strangely enough, Omega does this by eschewing it’s sister company’s ETA 2893 movement (which quicksets the 24-hour hand), and uses an Omega-designed quickset cadrature instead. 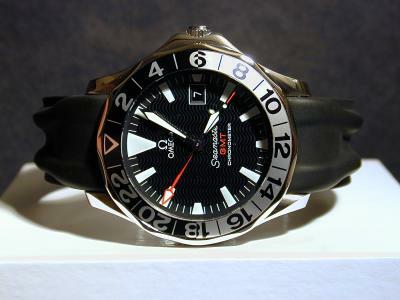 As a whole, I think the Seamaster GMT is an excellent value in the sports watch market, with an outstanding combination of price, styling, and functionality.